Have had the sub since 2006 and for a while it ran okay then the motor started stopping at forward throttle I then pull throttle to reverse and I then get forward speed again. This is repeated to get sub to operate. Have spoken to Chris at Sheerline over the years but we cannot seem to solve the problem. The esc is a Mtroniks Sub 8 40a brand new with a new PCM rx. Chris did replace the original esc but the problem has persisted. Have you tried a new battery? No receiver failsafe + an esc that can remember its settings = no problem. Hi microgyros are you saying the esc is not up to it. I just summarised a tried and tested combination that works well because it is forgiving. I can go further and say that using esc bec capability with sufficient voltage input also works well. Do you understand the level to which the voltage supply to your receiver and esc logic reaches when you throttle up? Do you understand the behaviour of PCM receiver and esc when it reaches worst case? Is it acceptable? Do you want an equipment combo or installation change that is more forgiving? You may be having problems with excessive current draw from the BEC on the Mtronik ESC. They overheat and switch off for a few seconds before restarting, I have found. I now use a separate BEC ( re-reading your post, maybe you have? )but I understand that Microgyros ESCs have a more generously rated BEC? Thanks David I have isolated the esc bec. I would suggest you consider permanently replacing the battery with an encased 2s life or 2s Lipo, install a bar graph voltage monitor inside the sub and then reconnect the bec. I don't know if you upgraded to a later Sheerline branded pitch control or not. That had a voltage (at the receiver) and radio signal diagnostic which identifies other issues too. Give Johnredearth in Melbourne a pm too. John you and I know each other from Surrey Park hope to be at Surrey on Sunday. If you are experiencing problems with cutting out or intermittency of operation once the boat has been running, it is as stated, a problem with the speed controller B.E.C overheating and finally cutting out as it reaches its max operting temperature. Some of them were externally mounted on the side of the speed controller body and used to fall off when they got hot, this aggravated the overheating problem. These types could be bolted to a seperate strip of aluminium which acted as a heat sink. This worked fine but was cumbersome in the confined quarters of the Akula. Others were built into the body of the speed controller and were inaccessible. All Sheerline Akulas are 6Volt operation, therefore you can dispense with the speed controller BEC and run the radio directly from the drive battery, this results in better radio performance as well as eliminating B.E.C problems. Obtain another plug and lead, either chop an extension lead, remove a lead from a dead servo or order a new one from a supplier. Attach this lead to the incoming battery terminal block and ensure you connect the red wire to the positive (red) incoming battery supply terminal, the black wire (sometimes brown) is connected to the black incoming battery terminal. It is worth stripping the fine wire insulation back sufficiently to enable doubling up of the wire, it is very fine and can sometimes pull out so you need to ensure it is securely attached. This now forms your direct power supply for your receiver so simply plug it in and you are ready to go. Some have asked if this method will result in a boat being stuck on the bottom due to a flat battery and dead receiver. Firstly, as the battery voltage begins to deteriorate, the boat becomes increasingly difficult to dive until it won't actually go under. At this point, the battery voltage is more than high enough to still operate all other funcions ie radio and motor. Continued use of the sub on the surface only will simply go on flattening the battery futher such that glitching of the radio will eventually occur, however, if the motor is then shut down, there will still be sufficient power in the battery to still leave the radio operational. To sum up, the radio will be the last thing to die once the high current drain functions are finally shut down, all this happens slowly and a bit at a time so red alerts need be sounded! I hope this helps anyone still experiencing problems with 6volt M/troniks speed controllers in their 6Volt Akulas. DO NOT DO THIS MOD WITH A 12VOLT SETUP OR YOU WILL DESTROY THE RADIO!! I'm still restricted due to surgery so there are no subs being produced at this time, I am currently waiting for yet more surgery and it may be some time before I am fit. I am still around in the workshop so if anyone has a problem, call me and |I'll try to be of service. To sum up, the radio will be the last thing to die once the high current drain functions are finally shut down, all this happens slowly and a bit at a time so NO red alerts need be sounded! Hi Chris I hope you get well soon. 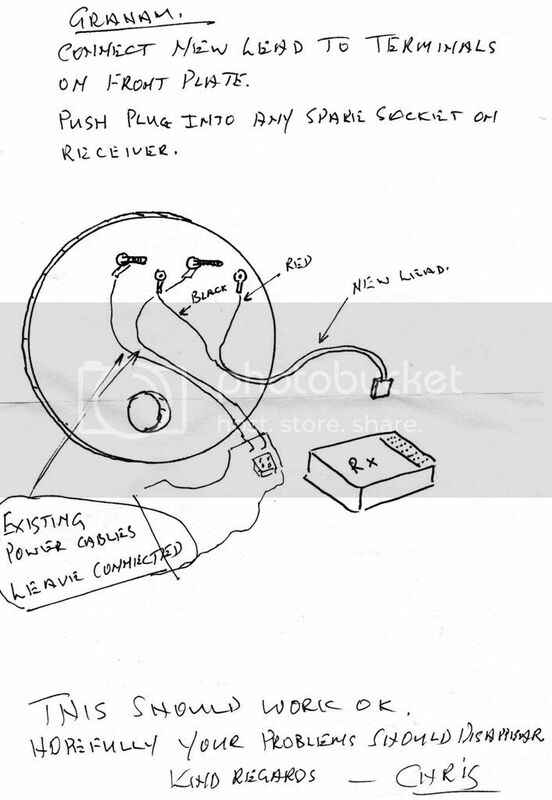 Have attached sketch you sent to me some years back explaining your setup. Unfortunately my sub continued to have this stop start problem even with this setup. I have obtained a new Mtroniks esc which I hope to try tomorrow at the club. It has been okay in the test tank(bath). Hi Graham. It does rather sound as though you have been very unfortunate with your speed controllers, it's a shame because very few ever come back exhibiting actual faults. Good luck with whatever replacement you decide to go with, it'll be interesting to see if your fault dissappears. Hi all good news ran sub today with new setup and all was okay. Hopefully this will continue and be the end of the saga.